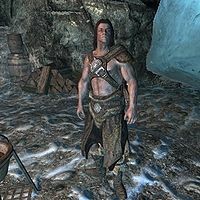 Badnir is a Nord warrior trying to make a living in Whistling Mine. He blindly listens to Thorgar, and continues to work the mine since Thorgar really needs him. He will sleep in one of the bed rolls at 8am for 12 hours, after which he will wander the mine, mining the few ore veins, using the cooking pot, or sitting at the table. He wears a set of hide armor and a matching pair of boots. He is equipped with an iron warhammer and carries some lower-class items and gold. When spoken to, Badnir will discuss the mine with "It's cold in the mine, but Thorgar really needs me, so I stay." He goes on to mention a couple reasons why he might stay: "Thorgar says we'll find rocks soon, the kind worth gold." and "I'm the best at breaking up rocks. Thorgar says so." This page was last modified on 14 January 2018, at 23:04.